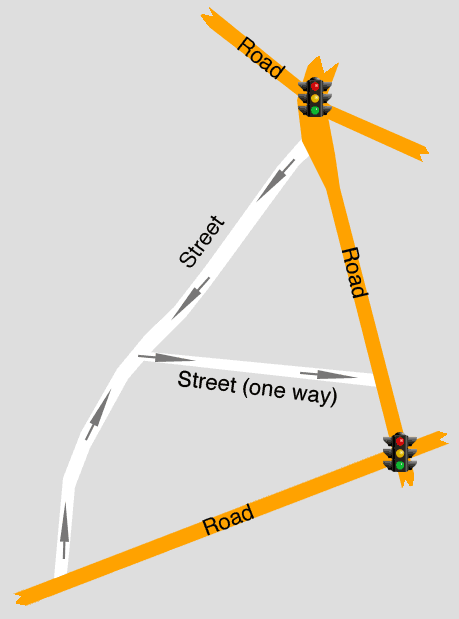 What is the difference between a street and a road? Roads carry traffic from one place to another. When you make a journey by car, you should be on roads almost the entire time, the exceptions being when you set off from home, and when you arrive at your destination. Streets are where people live, and the only traffic on them should be traffic that needs to be there – residents, visitors, deliveries. So why is the phrase “rat run” so familiar in the UK? A rat run is a street that is being used as a through-road. Most streets in the UK can be used like this, which is why children don’t play out in the street any more, as it’s highly likely that someone who has no business in the neighbourhood will be using the street as a short cut. This is the standard UK road design – but why? They are both residential streets (though one has many shops on too). There are main roads to the North, South, and East. They are connected directly to the road to the South. They are connected the road road the East, very near to the junction with the road to the North. They have a one-way street connecting them to the road to the East. One of them is great to walk or ride along, but the other one can be horrible. One of them has hardly any traffic, the other is full of speeding taxis, motorbikes and vans. 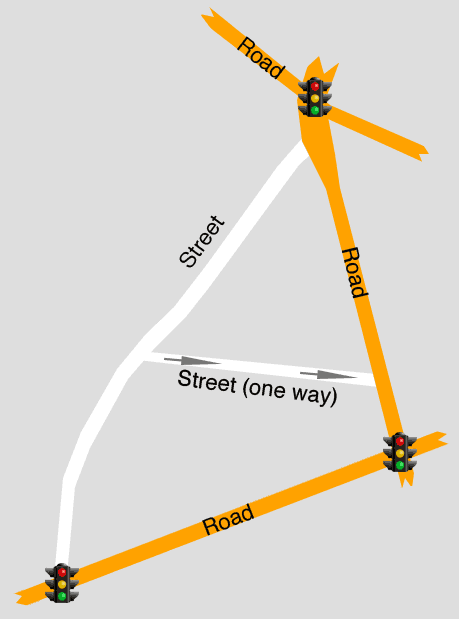 As there is no restriction on traffic passing through the street, traffic heading from the North to the South-West (or vice-versa) can skip one set of traffic lights by using it as a rat-run, instead of keeping to the main through-roads. On this street just around the corner (I’ve kept the same layout for comparison) you can see that rat-running is impossible here, it doesn’t help you to use the street instead of the road. As a result, only vehicles who have reason to visit the street will do so. 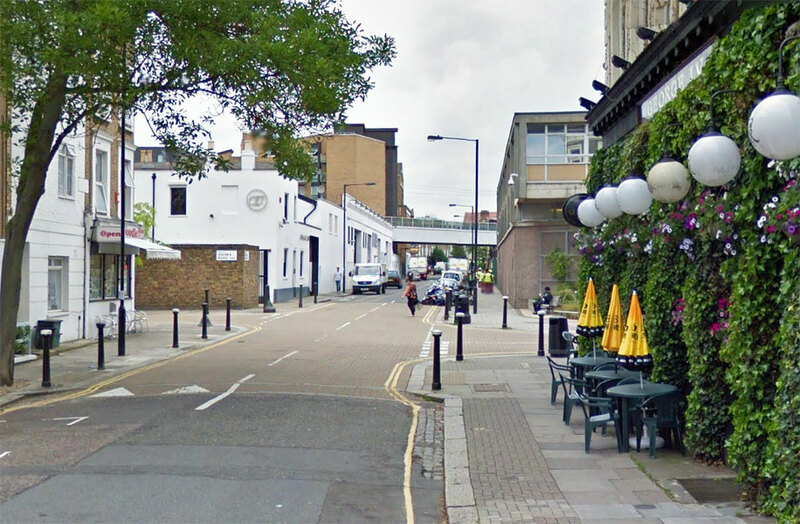 The streets in question are Hercules Road and Lower Marsh, both in London SE1. 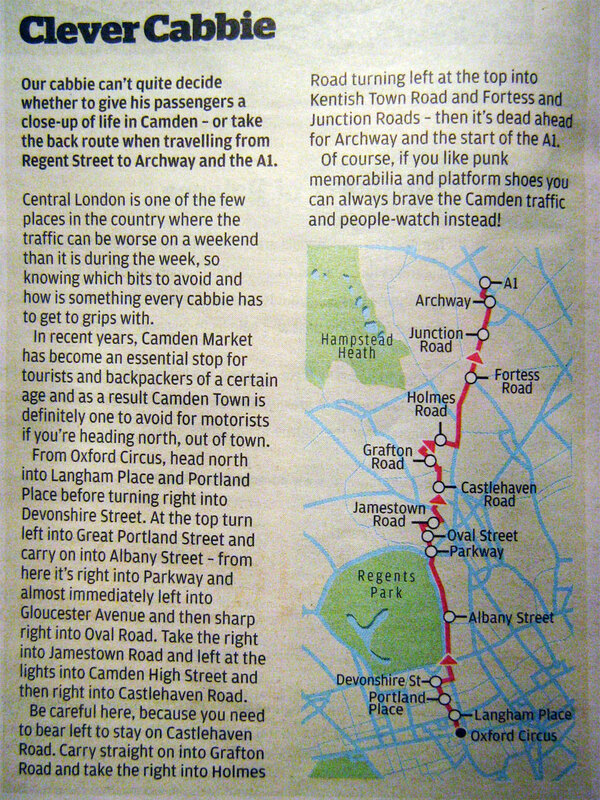 Okay, so I kept the same layout for both streets, they’re not really quite as similar as that – Hercules Road has three one-way streets connecting to the West, whereas Lower Marsh has none any more, due to Waterloo station – but they are very much the same in most important aspects. 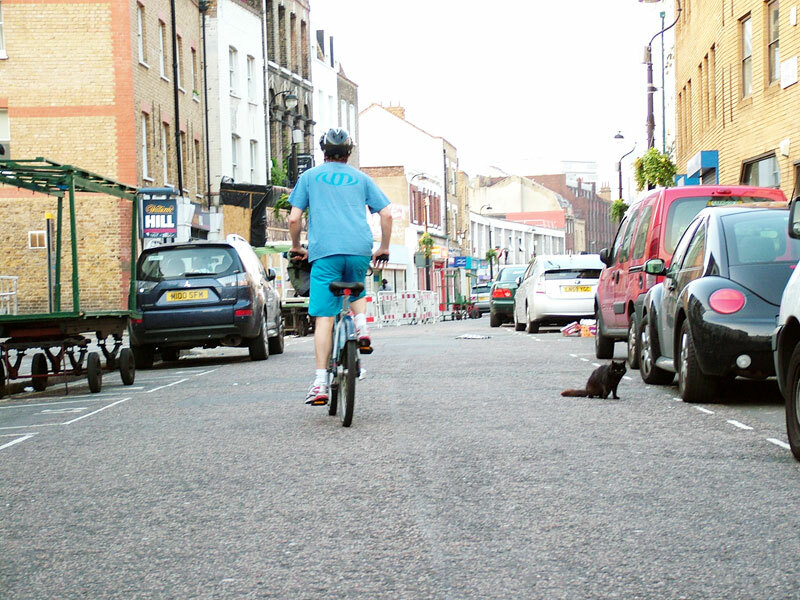 Lower Marsh is pleasant to walk down, ride down, or even drive down, if you must! On how many streets in central London can a cat sit and wash? Now this is what I call “shared space”! So here we have an example of good design, and bad design. 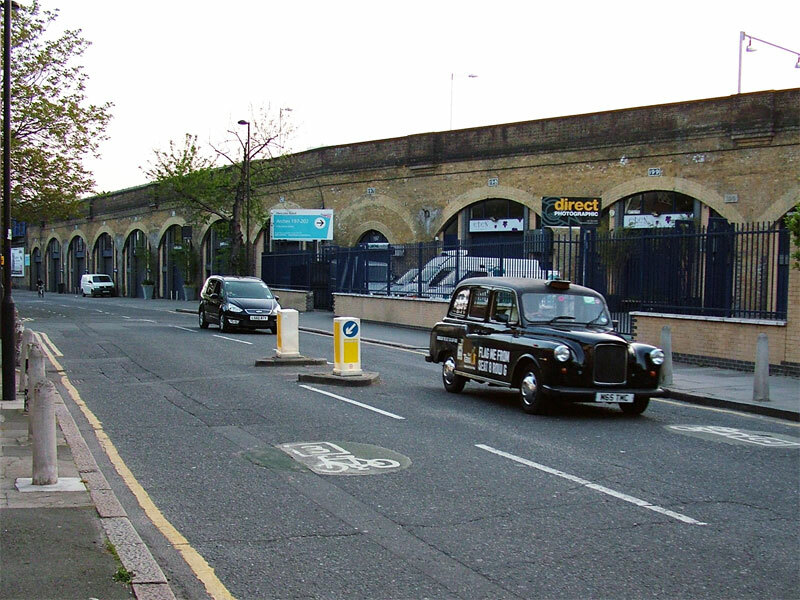 Lower Marsh works, and there is no reason for Hercules Road to be a through-route for motor vehicles. Who do I get in touch with to look at this? 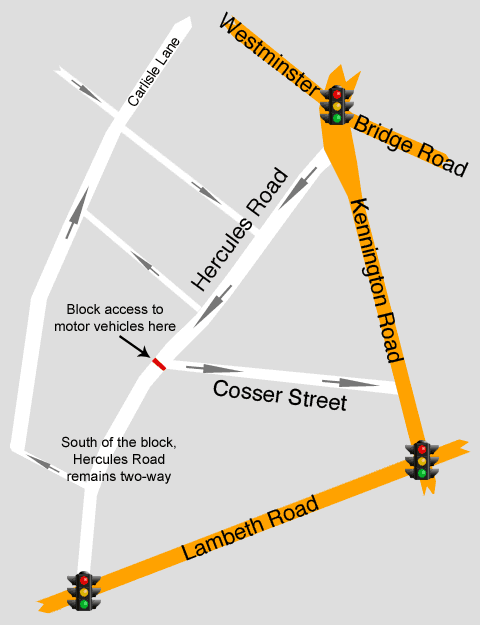 UPDATE, 29th of May 2012: I’ve been thinking about the options for Hercules Road (I do actually have that much time on my hands!) and a Lower Marsh-style solution won’t work, as it will still allow traffic heading North to rat-run around the traffic lights at the junction of Kennington Road and Lambeth Road. There’s tons of options, but I think the main point should be to remove the desire to use a street as a thoroughfare – a street should be a destination, not part of a route. Aah, I can see the cats sitting safely in the road now! I’m not sure whether the top half of Hercules Road needs making one-way or not (probably does), but I’m certain that putting that motor vehicle restriction in place will remove the desire for using the street as a rat-run. Residents and businesses still have access, but the ability to skip the lights has gone. I don’t know how much a few signs, a lick of paint and a concrete kerb cost, but I dare say it’s well within the budget of Lambeth Council to make Hercules Road into a street fit for those who live there.